Think Tank Logistics Manager 30 is my absolute favorite when it comes to all the camera bags, stand bags, photo bags and other bags I own for my flash equipment, tripods and cameras. 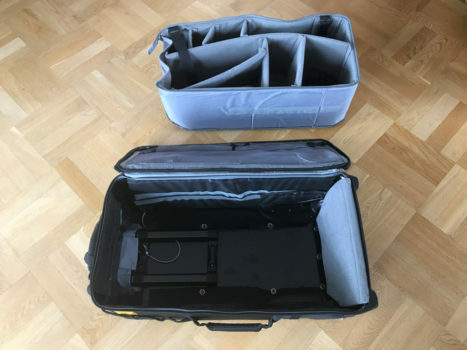 However, it is just like almost as with any rolling case, mostly made to be transported inside airports, offices or other places with a flat and even floor. With small and silly undersized skateboard-like wheels it immediately becomes hard or impossible to use it on gravel roads or a bumpy asphalt. Not to mention in a meadow with grass. I finally finished my home-made DIY project so my Logistics Manager 30 now instead have large wheels. This is version 1, which works very well, but I’ll will soon do a little smarter and neater solution. If you are planning to buy one, check out their excellent information on the website . It holds 2-3 large lights (Profoto B1/B2) plus two cameras, some lenses and a whole lot of other small stuff you need to get along. Plus some lighting stands hanging on the outside, and a reflector if you want to pack more. It’s easy, just open the zipper that attaches the internal, padded bag to the outer shell. Maybe you need to look for a tab, the opening zipper can be hidden behind a piece of fabric. Then just loosen the inner bag from the Velcro on the inside of the bag. I first bought a metal rod, 10mm, I think, and thought that this will be easy. Then I bought big, ultra-light and puncture-proof wheels from specialist dealer. The problem was that the wheels, fairly cheap and easy, with a quick lock/spring that locks the wheel to the axle demanded a small groove to attach. 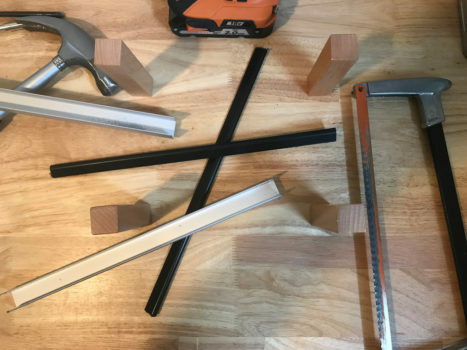 Do you have any tools at home that may be used to carve a small track a few millimeters into each end of your rod to use as the shaft, that might work. I asked a local bike repair shop if they could help me, but it took to long. So I found another solution. I searched for cheap, used strollers online, and was lucky to find a person who had butchered an old baby stroller. This axle on this stroller fits perfectly on a Logistics Manager 30. You can probably find a stroller with the right measurements that fits. The main thing is that it needs to have a straight axle rod that extends outside the rolling bag with some spacing as well. For this part of my project, I thought about a thousand different ways of doing it. In the end, I chose the manner in which I actually would finish the job and that didn’t cost too much. Measure and cut the alumiunum profile so it fits your wheel axle and bag. You could buy black (or white) edge protectors made of plastic, a bit like poster holders, those can be used to soften the hard edges of the profile a bit. I chose to put the holes near the edge of the bag, which is reinforced by a large piece of plastic that also is the housing of the wheels. The bag’s sides are interestingly made of mostly corrugated plastic, so there may be a point to select the most sturdy place of the underside with the thickest material. If you want, add something to strengthen the frame, just a small piece of aluminum might work. My choice of the size of the profile was based on the diameter of the wheel axle, plus some space in order to isolate the bit in a simple way with those plastic covers you see to the right. One on each side plus one at the wheel axle made sure everything would fit quite perfectly. This solution is based on wheels that turn on a non-moving axle, therefore it was easy to pack everything in cylindrical pipe insulation that both protected the profile from bumps as well as added a litte shock absorbtion. I held it all together with two pipe clamps. This was a workable solution to avoid being angry when I pull my ThinkTank Logistics Manager 30 and all equipment that can accommodate over gravel, cobbles, natural and otherwise. Maybe not the best designed product, but it works and makes my job as a freelance photographer easier. And significantly lighter on my back and shoulders. 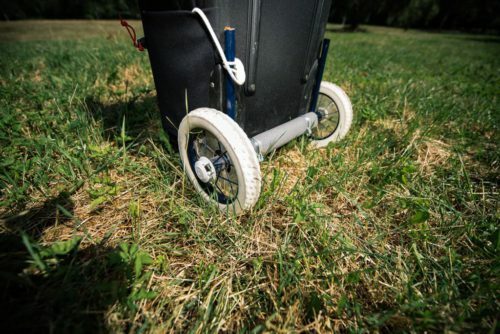 If you tried my invention, you would understand what a difference it is to pull 20-30 kg on small wheels compared to wheels that is actually designed to roll easily with more load than that. The reason I made such a “slim” solution like this, with alumiunium profile, is to be able to use the bag with the usual wheels sometimes. Even if I think I will never do that again. If you take off the wheels and axle can I put the pipe insulation back over the aluminum profile with two small straps and a small distance so it won’t scratch a floor or break itself. The next version will probably be a little better looking and based more on a lightweight frame on the inside and four blocks in each corner. Two of them will have some form of attachment for the axle, but can be used without large wheels also. When you have done a good case as this, why skimp on the wheels? Or rather, why not make it more modular? If you open the bag, you can see that most of it is plastic and rivets. Had they done a lightweight frame on the inside with some appropriate attachment points would everything be possible. Consider, for example, if there were accessories in the form of a wheel axle and large wheels? With mounts prepared in the design. Just remove the rubber cover from the attachment points and add whatever accessories that fits your needs? I have also thought about all the times you are outside in the rain and have to put down the rolling case to open it, just to have it soaked on the back side from wet grass or dirty from mud. Why no add some sort of lightweight retractable legs that puts the bag a couple of inches above the ground when needed? 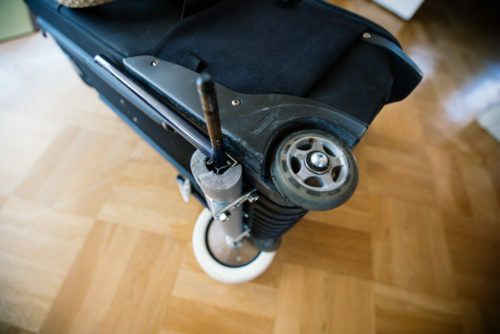 The wheels and axle of a stroller I bought used, costing 15 USD/EUR. Aluminum profile plus plastic edges might cost 10 USD/EUR and pipe insulation perhaps 2 or 3 USD/EUR? Bolts and nuts, I already had. A total of perhaps 30 USD/EUR. Do you have a similar roller bag for your lights, tripods and other equipment and avoid gravel as much as you can, I can recommend this solution. The hardest part was to decide on how to solve the problem. The assembly took maybe an hour or so. It was quite easy. If you have questions or ideas on how to make this project better, please write a comment. Yes! Bigger wheels to the people! The airport-focus that the camera strollers of today is marketed with sounds cool, but the reality floor is NOT the smooth airport-floor. Gravel, grass, asphalt, dirt and so on is where photographers go, because it is in our nature NOT to follow the path. Please! Make a solution for bigger wheels! Sooner or later (I hope sooner), there will be some kind of development in this area. Right now, most bags and cases are frightingly similar and offers very little new in usability. 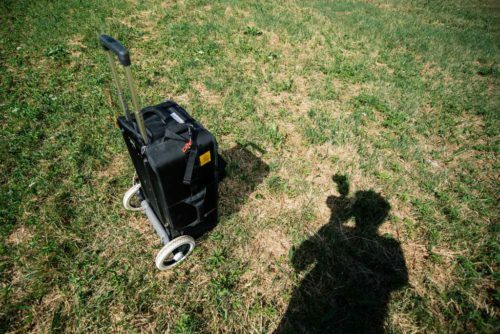 The best way would be to ask a couple of photographers how and where they use their rolling cases, I would guess very few only work in airports. 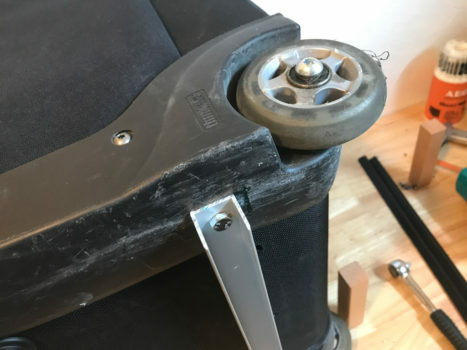 I completed a similar project using 45.7cm Thule stroller wheels with built-in axles to modify my wife’s rollator for unpaved roads or fields. The original 12cm swivel wheels were only usable on smooth surfaces. I purchased a pair of Thule wheels, four axle bearings, aluminum extrusions for brackets, and longer metric bolts to attach them to existing bolt locations on the Rollator. 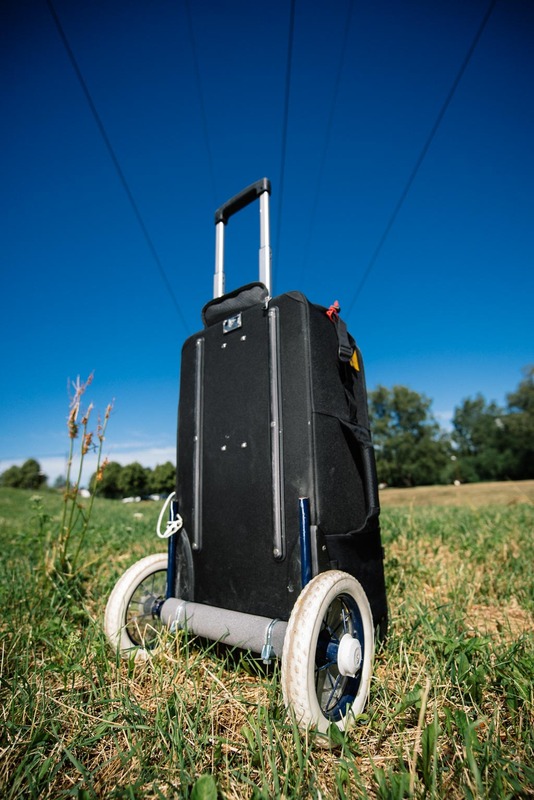 The modified rollator has survived many miles on our dirt roads and flights across the USA. Your version 2 rolling camera case can use my design if your budget, tools, and patience are sufficient. I can email photos showing how it was done. that sounds interesting. Please send photos, it would be very nice to see other solutions to a similar problem. stefan@stefantell.se is my address. Thanks.